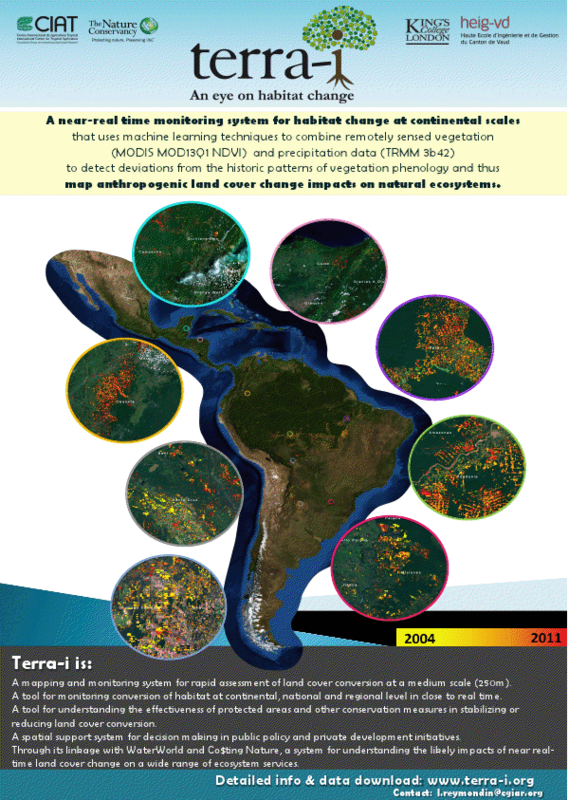 Terra-i is a system for near real time land cover or habitat change monitoring using the MODIS sensor on NASA’s Terra and Aqua platforms. We use machine learning algorithms to produce maps and analyses of land cover change every 16 days from 2004 to present. You can visualise the data within a geobrowser (web mapping) environment or download the Geographical Information Systems (GIS) files for further analysis (after creating a free account). Terra-i is currently operational for all of Latin America and moving towards pan-tropical operation soon. See also the University of Maryland 30m Landsat-based annual product here. Terra-i is a collaborative project between the International Centre for Tropical Agriculture, The Nature Conservancy, HEIG-VD (Haute Ecole d'Ingénierie et de Gestion du Canton de Vaud) and King's College London. Visit the Terra-i system here. Terra-i can now be used offline (i.e. in the field) from an Android smartphone or tablet computer, see instructions here. Terra-i in Google maps, yellow areas saw significant land cover change close to 2004, red areas close to 2010, pink areas in 2011 and 2012. Note that Terra-i can also be used within the WaterWorld and Co$ting Nature Policy Support Systems to understand the impact of recent land cover change on hydrology and the production and delivery of ecosystem services. The figures below show terra-i deforestation in northern Colombia by pixel (left) and major hydrological basin (right). The blue, green and orange areas show areas of higher tree cover loss since 2004. Red areas showed zero loss. The figures below show the impacts of this deforestation on water balance and runoff according to WaterWorld. The figures show change in water balance by pixel (left), indicating that water balance significantly increased in the areas in which deforestation occurred and that these water balances cumulate downstream to produce significantly higher flows (right). Indeed the town of El Banco at the confluence of the rivers with higher flow (the César and the Magdalena) has seen some devastating floods in recent years (see here). The figures below show output from WaterWorld used to examine the impacts of terra-i deforestation since 2000 in Rondonia, Brazil on water flows (left) and erosion (right). WaterWorld was used to calculate the hydrological baseline and terra-i chosen as the deforestation scenario to run the alternative. The images show the change in flows (left) and sediment from the baseline to the alternative. Flows increased below of reduced evapo-transpiration. Erosion increased in the deforested areas and sedimentation increased in the river draining these areas. DISTRIBUTION: Users are prohibited from any commercial, non-free resale, or redistribution without explicit written permission from CIAT. Users should acknowledge CIAT as the source used in the creation of any reports, publications, new data sets, derived products, or services resulting from the use of this data set. CIAT also request reprints of any publications and notification of any redistributing efforts. For commercial access to the data, send requests to Louis Reymondin (louis.reymondin@cgiar.org). NO WARRANTY OR LIABILITY: CIAT provides these data without any warranty of any kind whatsoever, either express or implied, including warranties of merchantability and fitness for a particular purpose. CIAT shall not be liable for incidental, consequential, or special damages arising out of the use of any data. ACKNOWLEDGEMENT AND CITATION: We kindly ask any users to cite this data in any published material produced using this data, and if possible link web pages to the Terra-i website (www.terra-i.org).